Tis the denim season again, and an embellished jacket makes it all worth while. Cooler days and chilly nights seem suddenly inspired by chic style and vintage flair. This is the second denim jacket I have purchased from Hillary. It gorgeous! I bought the dark denim and the embellishments are so pretty and eye catching. The size is spot on. I did size up one size to accommodate sweaters and layering. I will go back for another color now. Highly recommend. I bought a medium and the fit is great. The embellishments are tastefully done, just enough. The garment is unique, eye catching and can be worn by a variety of age groups. Love this jean jacket! I have been looking for a jacket with embellishments for a long time. When I opened the package I was so surprised. 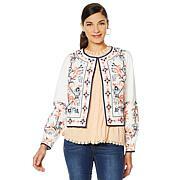 The jacket is beautiful and well done The embellishments are much more elegant than it shows. Extremely well made and gorgeous! This embellished jacket is a winner. I love denim jackets and own many, but this one is really lovely and my favorite.